So good and you have been a great example to me regarding community. I have watched you interact with SO many others on here and it has opened my eyes to reaching out more in 2014. I completely agree with Susie. I've been something of a hermit, even in the blogging world, most of the time, but you teach me that there's beauty in reaching out, in connecting. Well said. Hopefully your prompts (and others I read) will actually PROMPT me to join the community. Wanting to be read? Yes. I do. 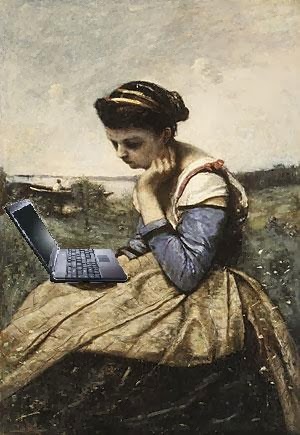 And yet, here's an honest confession for you, when my novel failed, the anonymity of blogging meant I didn't have to care/stress/wrangle for an audience any more, and that only God could pay attention to whether I was read. Apparently the balance has flipped to the other side now. Anyway, these are REALLY good posts you're doing about the core of the motive, process and issues of blogging. Thank you. Dawn: You have some good points here. I haven't always gone out to other blogs because of the nature of my blog. I did for Christmas Eve and had different readers and got two more followers Happy New Year and blessings to you and to yours. You have been a real inspiration to me in so many ways during this journey. I wish we could all get together sometime in reality, face to face (not just on skype, which I apparently DON'T have after all on my old laptop!) and just laugh and hug and share our joys and sorrows and victories and defeats with one another and come away refreshed and revived and rejoicing to have such wonderful friends from all over! Maybe in heaven that will happen, but it would be SO much fun to have it happen for real here before hand! Until then, keep sharing and keep the blogs rolling! Great wisdom in your two posts on what you learned about blogging. So glad I made my way here through Barbie. Thank you for sharing with us. Blessings. Thanks for the great inspirations about blogging. I'm definitely going to look into that 31 day challenge. Happy New Year! Wise words my friend, wise words!